What is Miss Hickory's Tea Room? 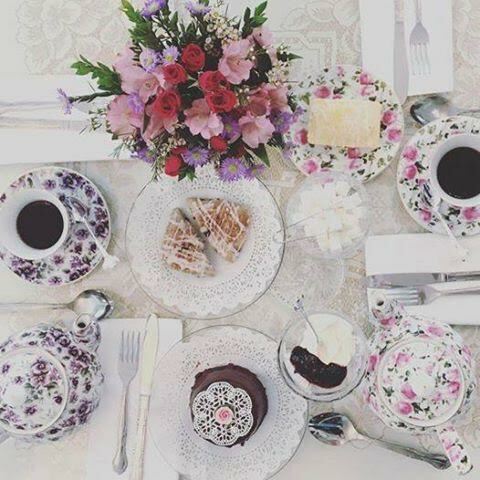 Miss Hickory's Tea Room is located in a mid 1800s farmhouse in a beautiful historic district of Strongsville, Ohio. We welcome our patrons back to the 'turn-of-the-century.' They will be greeted by our hostesses who will be dressed in early 1900s attire. When one enters our tea room they will feel as though they have stepped back in time, to a peaceful, more relaxing time. Stepping into our front parlor, they will be asked to sample our 'tea of the day' at our 'one-of-a-kind' tea steeping station, while waiting to be seated. Once seated, they will be able to sit back and enjoy the surroundings, listening to music from days gone by, while sipping a nice cup of hot tea. Miss Hickory's Tea Room welcomes you! We offer a wide selection of dishes, along with a variety of teas and other beverages. Please take the time to browse through our menu. Relax & enjoy! Miss Hickory's Tea Room is housed in a mid 1800s farm house with plenty of rooms with their own individual feel to host your next event, in addition to our spacious outdoor deck, which will give you the youthful feeling of being in a 'tree house.' Feel free to browse our website or stop in to see which room you'd like to reserve for your next event. Click on the 'Events' link on our homepage for a list of some of the events we provide. We'll be happy to serve your needs!